It was a beautiful evening as I drove up to Braemar and the forecast was pretty good for Saturday. As a consequence of this various ambitious plans were hatched on Friday night by assorted club members. Braemar appeared to be full, as the advance party reported that all the restaurants were fully booked for Saturday night (leading to the chip shop being much frequented) so it seemed like we weren't the only ones with big plans for the weekend. The following morning, Tim, Victoria and I pitched up at the Linn of Dee car park to find it absolutely heaving with walkers and bikers. Closer inspection revealed that it was due to the Water Aid charity event and therefore I don't think anyone had an empty summit to sit on between 12.00 and 14.00. More power to their respective elbows. 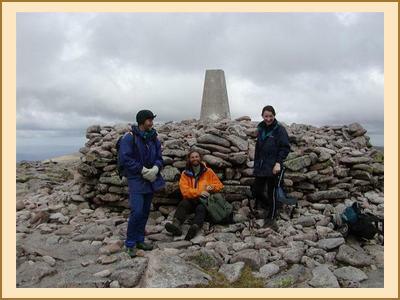 We set off for a tour of Carn a' Mhaim, Ben Macdui and Derry Cairngorm in one direction 'sans bicyclette' whereas Bill Brown favoured the opposite direction with his bike and our paths crossed three times during the day, once on the summit of Ben Macdui. Here we were also entertained by a snow bunting making off with the remnants of numerous sandwiches. The route back, though rather long, was enlivened by meeting a Viking and a tennis player. Alarming rumours also reached us of a couple of cavemen behind us somewhere. People certainly do strange things for a good cause. Meanwhile, Kenny and Alison were having a long day too, involving some scrambling and taking in Derry Cairngorm and Ben MacDui en route. Not to be outdone, Hywel took his bike up past White Bridge somewhere and took in Ben Bhrotain, Monadh Mor, Cairn Toul and the Devil's Point (I think). Richard Hartland decided for the long hike along the Geldie Burn then climbing An Sgarsoch and Carn an Fhidhleir and was back in time for tea (fairly impressive!). 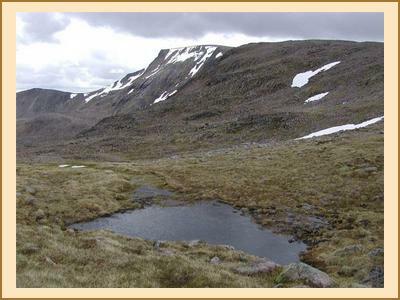 Richard Alldread went for a hike on the hills around Glen Callater including Carn an t-Sagairt Mor, Cairn Bannoch, Tolmount and Carn an Tuirc. Dennis took a team including Jenny, Albert, Owen, Judith and Sam around the base of Ben Avon that he said was about 15 miles long but certain members of the party disputed this hotly and were convinced it was quite a bit more. Lesley tackled a nearby Graham (and encountered a herd of about 200 deer) and Anne Craig who showed up during the evening had climbed two Corbetts near Ben Avon (apologies I can't remember which ones). So one way or another there were some fairly tired people sitting around the bunkhouse on Saturday night. However this did not deter certain stalwarts from walking the 100 metres to the Fife Arms for an evening of entertainment. Whereas some folk were content with drinking ale, Victoria and I hit the dance floor. I think the scariest moment was when the entire pub got up to dance to 'Is this the way to Amarillo'. Enough said. The following day everyone split up in different directions and if I have it right then some of the selections were - a couple of Lochnagar hills for Tim, Sgur Mor for Anne Craig, Carn An Drochaide for Hywel, osprey watching for Lesley and Glas Tulaichean for Richard H. Victoria and I climbed An Socach with pretty good views but highly unpredictable weather including freezing cold winds and sleet on the summit, brilliant sunshine for our lunch stop and a very heavy shower on the dash back to the car. Between all of us we seemed to have inadvertently done our own small scale version of the Water Aid challenge over the weekend.